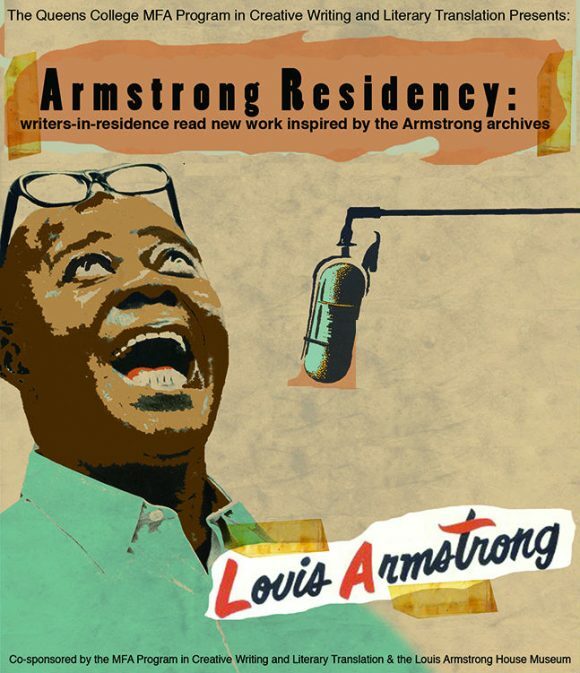 Collected in this exhibit are text-based and visual art materials created out of a residency program that plunges writers from the Queens College MFA in Creative Writing and Translation into a single archive: the Louis Armstrong House Museum (LAHM). Residents are asked to engage with, to make alive again, and to struggle over how to make factual materials, inanimate objects, and history long since passed, vibrant and urgent for a new audience. The residency, started in 2008, offers MFA candidates a three-month residency to explore new ways of creating work within a socio-cultural framework. As of Spring 2017, over twenty residents have produced an array of prose, poetry, screenplays, plays, and ‘zines in response to a variety of materials and ideas. In addition to the text-based work on display, the posters exhibited were created by undergraduates from the Queens College Art Department through the LAHM Writers-In- Residence Program poster contest. Rommi Smith is a poet, playwright, performer and the first British Parliamentary Writer in Residence. A John Barnard Scholar at The University of Leeds, UK, Smith’s transdisciplinary, practice-led PhD, artfully combines scholarship with performance, focusing on the history of women jazz and blues musicians. In this lecture which fuses poetry, music, performance, and archival evidence, Smith builds up the narratives of her subjects and their historical contexts, whilst considering the roots of her doctoral research path. Makeba Lavan is a doctoral student in the Department of English at the Graduate Center, CUNY. There, her research focuses on (African) American Studies, Speculative Fiction and Popular Culture. In addition to her studies, Makeba also teaches at Lehman College and LaGuardia Community College. Julius Baltonado is an Asian American, New York poet, hailing from Cebu City, Philippines. He received his MFA in Creative Writing And Poetry from Queens College, where he did a fellowship for the Louis Armstrong House Museum Archive. He is a writing instructor at Queensborough Community College, and is Program Manager at Bowery Arts + Science. Mary Catherine Ford is an MFA candidate at Queens College on the Fiction/Nonfiction track. She is working on a memoir of the events and people of her chaotic childhood as one of eight children in an Irish Catholic family in the predominately African-American neighborhood in Chicago. She was the 2015 recipient of the Girro Cestaro scholarship. A recipient of the Louis Armstrong House Museum writer residency for 2016, she worked on postcard poems as well as flash fiction that try to breathe life into the people Louis Armstrong lived and created alongside in Corona, Queens.